In an age of electronics, endless television options, digital films and streaming options, we forget a simple time when the best form on entertainment was sitting around the radio and listening to entertainment with your family. This was the Golden Age of Old Time Radio (OTR). It was in these shows that you were required to use your imagination, place yourself into the story, and listen to the words and scripts, yes actually listen for longer than 5 min waiting for the next action sequence. Often the announcers set the tone, the time and the place and you were whisked away into a wonderful world for 30 minutes. Now OTR had many genres from the spooky, or comedies from Bing Crosby, The Great Gildersleeve, Bob Hope, Our Miss Brooks, or even a young Scrooge McDuck in The Alan Young Show. 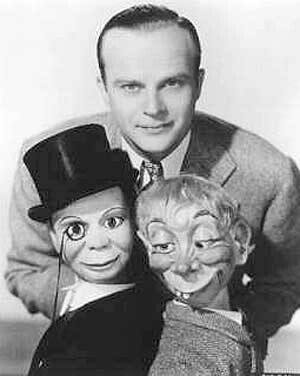 But one that remained to be popular was The Charlie McCarthy Show with Edgar Bergen. Most Disney fans will know this team from the classic animated feature Fun and Fancy Free as it was this pair that brought much light-hearted fun to the film. 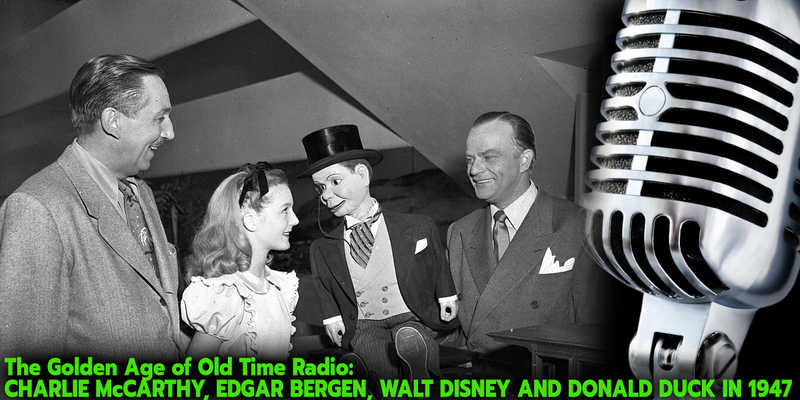 Edgar loved Disney and his work and even released a book where Charlie McCarthy met Snow White. And it is clear that Edgar’s Mortimer Snerd is a direct inspiration for Jeff Dunham’s Bubba J! Walt Disney was Uncle Walt and we knew him from appearing on television and introducing many things, but sometimes it was fun to see how the tables were turned. That is what happened on The Charlie McCarthy Show. It was on September 21, 1947 and Edgar and Charlie, along with their sponsors Chase and Sunburn Coffee, welcomed Walt Disney and Donald Duck to the program. The true gem of this program is how unscripted it seemed, even though it was all planned out. Walt makes his way to the show and talks about Fun and Fancy Free, makes a few jokes and takes a few punches himself. So take a moment and get introduced to the Golden Age of Old Time Radio (OTR), Walt Disney, and if you already love OTR, enjoy this bit of nostalgia that not only passes the time away, but helps us to remember the man that created the brand we love, that sadly now, takes the name Walt off of most of it.